"To Bonnie From Delaney" - Delaney Bramlett (g, voc); Bonnie Bramlett (voc); Duane Allman (g); Little Richard (p); Jim Gordon (keyb); Tommy McClure (b); Sammy Creason (dr); Sam Clayton (cga); Alan Estes (cga, perc); Jerry Jumonville (as); King Curtis (ts) & The Memphis Horns; a.o. 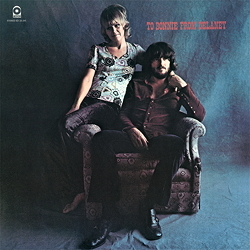 ﻿The married couple and musical duo Delaney & Bonnie ignited critics, fans and famous musical colleagues to veritable bursts of exultation. Mick Jagger of the Rolling Stones talked matter-of-factly of »convincing white gospel song«, while Eric Clapton regarded the duo as the »best pop band in the world«. Clapton’s enthusiasm went so far that he invited the pair to accompany him on a peaceful tour of Europe and was booed by German fans because he stood in the background as a mere accompanist and did not play any solos. The master of the guitar may have had good reasons for staying out of the limelight, if one is to believe the Chicago Daily News, who declared that Delaney & Bonnie were better than Aretha Franklin and Ray Charles together. Indeed the combined voices in the arrangements are so closely knit that there is not a millimetre of space between the singer and backing. In "Hard Luck And Troubles", a dry cantankerous groove, the vocals cling to a sinewy bass line, criss-crossed by short chords on the organ. Gospel is celebrated spiritually, yet not too much so, in a rocking, rhythmic and dense interplay between the soloist and chorus. And what is more: the great ballad, hovering above a vibrating carpet of sound on the organ ("The Love Of My Man") and crisp, firm winds ("Alone Together") are included in this exquisite collection of great and even great songs.